Home > Food Facts > Crackers Vs. Chips: Which Is More Healthier Of The Two? Crackers Vs. Chips: Which Is More Healthier Of The Two? When people want to make healthy choices, what to snack on always seems to be an issue. Especially when you’re craving that familiar taste of salt. The go-to snacks are crackers and potato chips. From experience, those snacks were always part of my night-time binges. I would devour a bowl or two of potato chips with sour cream and onion dip, or a plate of cheese and crackers. Many of these products contain additives, preservatives and chemicals, which are not good for your body and digestive system, especially at night. Compelling advertisements have something to do with the reason you crave snacks so badly. One tried and true Lay’s potato chips ad says, “Bet you can’t eat just one.” And you can’t. The nutrition information on the packages is misleading; it follows a serving for 15 to 20 pieces, yet it’s true what Lay’s says, you can’t eat just one or two or often 15. Before you know it the bag is gone. Crackers are party food and make a quick and easy appetizer—tasty and popular with a crowd. The problem with chips is there are so many flavors and varieties, including persuasive “healthier” vegetable flavors. On the other hand some don’t use a disguise at all. Some come in crazy flavors like pizza or nacho cheese. The industry is worth over a billion dollars so people obviously love their chips. But for this showdown, let’s stick with the basics. 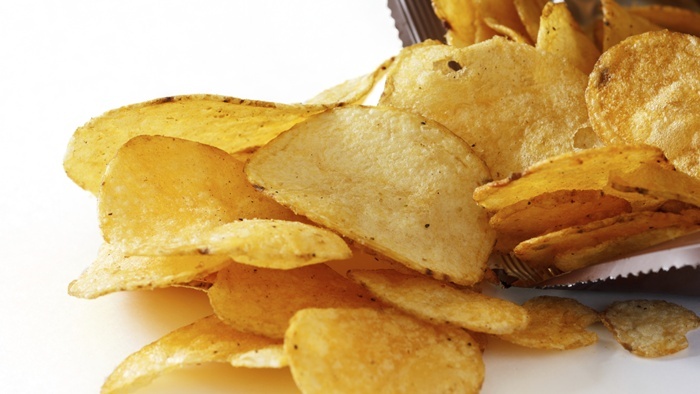 The nutritional value of Lay’s Classic potato chips isn’t so good. Fifteen chips means you will be consuming 160 calories, 10 g of fat, 170 mg of sodium, 1 g of dietary fiber and 2 g of protein. The ever-popular Doritos don’t fare any better. An 11-chip handful has 140 calories, 8 g of fat, 210 mg of sodium, 1 g of fiber and 2 g of protein. That is certainly a lot of fat and a lot of salt. Crackers are often seen as a healthy alternative because they don’t have the grease factor and some come free of salt. The variety is still there though. As you can see from any cracker aisle at the grocery store, the selection can be massive. Let’s take a look at Nabisco Ritz crackers and Premium Plus crackers (salted tops) also referred to as soda crackers. They are dry and plain, by comparison, but does that make them healthier? When you eat 15 Ritz crackers (so you will notice that provides significantly more volume than the slight of chip) you also get 240 calories, 13.5 g of fat, 315 mg of sodium, no fiber and 3 g of protein. Meanwhile, a seven-cracker serving size (20 g) of Premium Plus crackers includes 90 calories, 2 g of fat, 230 mg of sodium, 1 g of fiber and 2 g of protein. Crackers Vs. Chips: Which is the Healthier Option? There is some good news here. The health outcome of this showdown can have a lot to do with your own choices. It depends on the flavor, the quantity and the type of chip or cracker. There are few vitamins, minerals, protein or fiber within crackers or chips. Are you going to eat an entire bag of Lay’s chips for nutrition (about 20 g of protein and 10 g of fiber)? No, you are eating them to satisfy your salt craving, despite all the fat, calories and sodium that contribute to weight gain and other health problems. So by process of elimination, the winner is the cracker. For one thing, the serving size tends to be a little smaller. You are much less likely to binge on crackers than you are on salty chips. People tend to only eat about five Premium Plus soda crackers with a soup or with cheese, which gives them less than the serving size on the nutrition label—and the potential to eat them alongside something that has the potential to be healthy, like a hearty vegetable soup with a few organic vegetables. Follow my reasoning? Still need those potato chips? I like Neal Brothers blue corn chips with flax. They contain organic blue corn, organic sunflower oil, organic flaxseed, sea salt and a trace of lime. They could take the edge off the salt craving you are feeling and give you a little bit of flavor, too.